■ BS EN 1990, Eurocode: Basis of structural design and its UK National Annex[14a]. ■ BS EN 1991, Eurocode 1: Actions on structures in 10 parts and their UK National Annexes[15a]. ■ BS EN 1992-1-1, Eurocode 2 - Part 1-1: Design of concrete structures - General rules and rules for buildings. and its UK National Annex[1a]. ■ BS EN 1992-1-2, Eurocode 2 - Part 1-2: Design of concrete structures - Part 1-2. Structural fire design.i2] and its UK National Annex[2a]. ■ PD 6687 Background paper to the UK National Annexes. 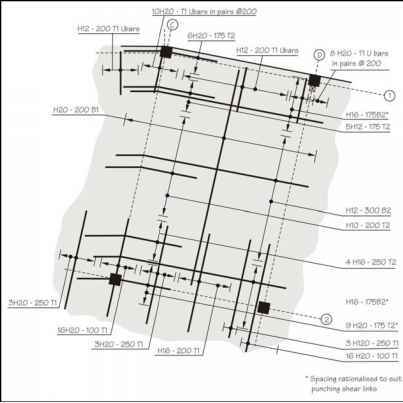 ■ BS EN 1997, Eurocode 7: Geotechnical design -Part 1. General rules. and its UK National Annex[16a]. (TBC) BS EN 1992-3, Design of concrete structures - Liquid-retaining and containment structures. ■ BS 8500-1: Concrete - Complementary British Standard to BS EN 206-1: Method of specifying and guidance to the specifier. ■ BS 4449: Steel for the reinforcement of concrete - Weldable reinforcing steel - Bar, coil and decoiled product -Specification[1S]. ■ PD 6687 Background paper to the UK National Annexes BS EN 1992-1. ■ BS ENV 13670: Execution of concrete structures. Due 2008. ■ Concise Eurocode 2 for the design of in-situ concrete framed buildings to BS EN 1992-11: 2004 and its UK National Annex: 2005. ■ How to design concrete structures using Eurocode 2. ■ Standard method of detailing structural concrete, a manual for best practice (SMDSC).